As you know, Ella was scheduled to return home from Portland today. She did so successfully this morning, arriving in Seattle a little before noon. I heard from her first at about 7am when she left her apartment to catch the city bus. Then I received regular text messages from her as she waited for the Bolt Bus in Portland, and updates as the Bolt made its way north along I-5. 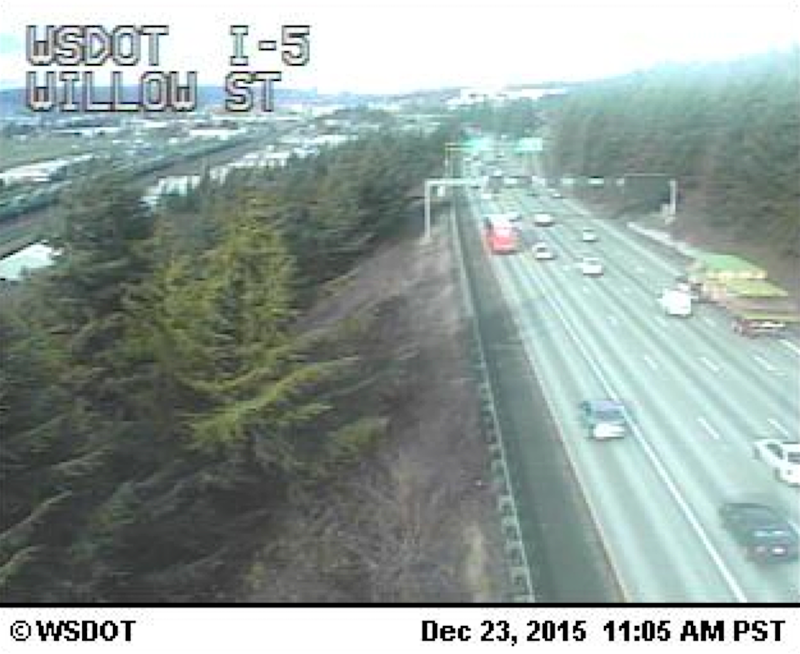 I got the bright idea to see if I could time the viewing of an I-5 traffic camera with the passing of the Bolt. After clicking camera after camera link, I was finally successful as the bus approached south Seattle. That orange blob in the left lane is the bus with Ella sitting somewhat comfortably inside. I say “somewhat” comfortably as she mentioned the passenger next to her spent most of the ride sleeping… and snoring. Which makes me think, Celeste. Did that seat next to you on the Seattle to Paris flight yesterday remain empty? Tonight, Chloe, Ella, Melinda & I went out to dinner at U Village. We also did some last minute holiday shopping. We’ve long had a family tradition to open presents with just the four of us on the winter solstice. But with Ella not yet home, we waited to do so until tonight. 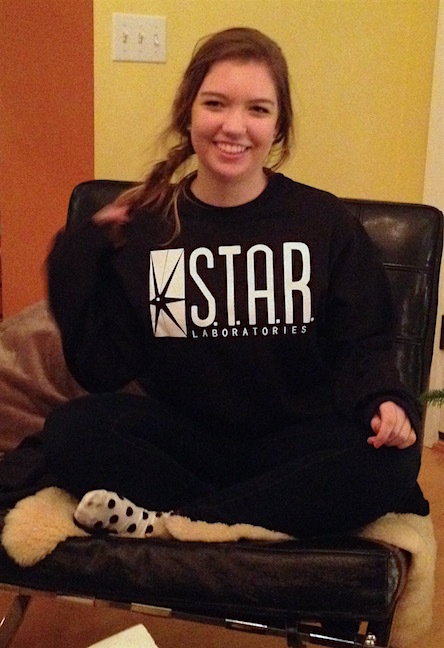 Among the gifts opened include the sweatshirt Ella is wearing in this photo. It’s a reference to The Flash. 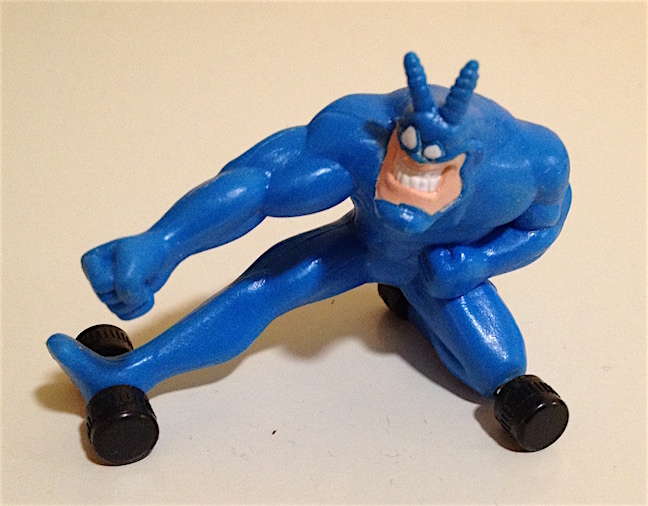 And speaking of The Flash makes me think of The Tick, of course. Guess what was waiting for us when we got home yesterday from taking you to the airport? That’s right. For now, this picture will have to suffice until I can bring you the item itself. I imagine you’re a bit tired so I’ll stop writing, thus allowing you the opportunity to get some sleep. Just try to get your sleep at night, okay?